These two closely related plants appear very early in the spring. 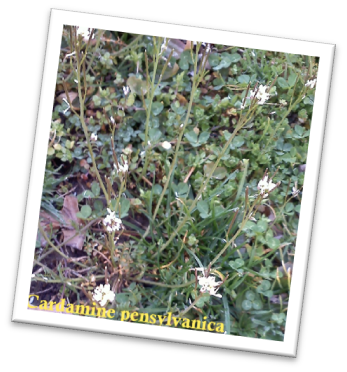 Both are commonly called Lady's Smock in the local vernacular; however, the more common of the two is actually Pennsylvania Bittercress. The most noticeable difference is that pratensis has pink flowers whereas pensylvanica's flowers are white. A typical problem with folk names of plants is that the same names are often used for very different plants. 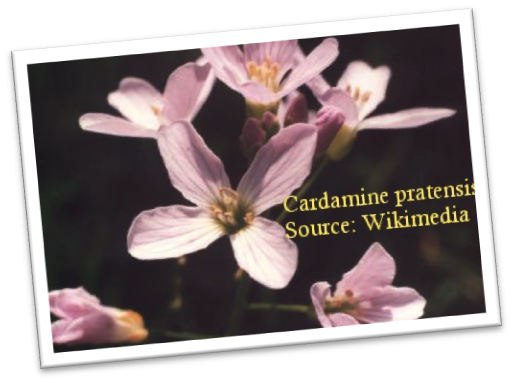 For example, the term "Cuckooflower" is used as a name for Cardamine pratensis and for the unrelated Lychnis flos-cucli. Even without knowledge of Latin, one can see that the latter's Latin name contains a reference to the cuckoo. To top it off, the name used in Deitsch for both plants is Schtruwwlichi Nans, or Disheveled Nancy. Lady's Smock, whether of the pratensis or pensylvanica variety, is an edible green in the mustard family. 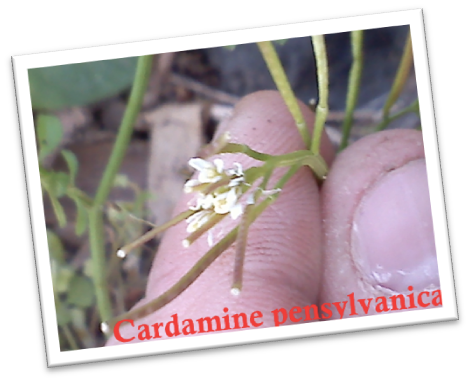 The leaves, flowers, and seedpods produce a slightly peppery flavor that is a good addition to salads. Early insects find the plants as a source of pollen. The plant is rich in Vitamin C and mustard oil compounds, which stimulate the liver and the kidneys. Topically, the herb can promote blood flow to the skin, thus aiding against skin irritations and in alleviating the pain of arthritis and rheumatism. Lady's Smock is used in bitter tonics and contains iron, magnesium, and potassium. The plant may be used fresh or dried. The dried plant may be used in teas or powders. The fresh plant may be used in teas, compresses or salads. It may also be crushed and about 4-5 tablespoons taken as a juice. Lady's Smock is also considered to be sacred to a variety of wights, including fairies and sprites. This article was originally published in the Spring 2012 issue of Hollerbeer Haven.